Card Text Play: The next creature or artifact you play this turn enters play ready. Can I play two Soft Landings to have two creatures or artifacts enter play ready? Yes, but you must play the second Soft Landing after the first creature or artifact is played. 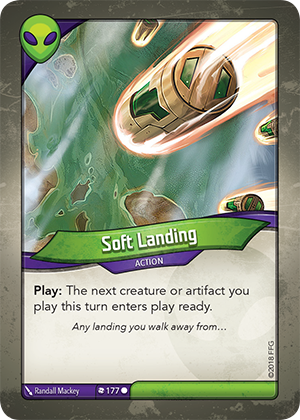 If you play two Soft Landings in a row and then two creatures, only the first creature played will enter play ready.